FocuS-E and her sister company are active in PV solar equipment since 2009. We distinguish our selves by our specific specialist knowledge and our service minded attitude. Have been built for a carefree energy production through many years. We primarily ship to installers and support them in developing knowledge and experience. The APS product portfolio has a seemless fit with ours. A proven product on different continents (ca 90 % marketshare in Australia and the Far East, 20% in the USA). European market introduction as of April 2014. Aftersales and distribution organised from the Netherlands. Competitive pricing: 20% to 45% cheaper than systems from Enphase, Enecsys, Power One, SMA en Solar Edge. APS signed the first European distribution contract with FocuS-E. The mutual trust in eachothers quality and experience was here the decisive factor. 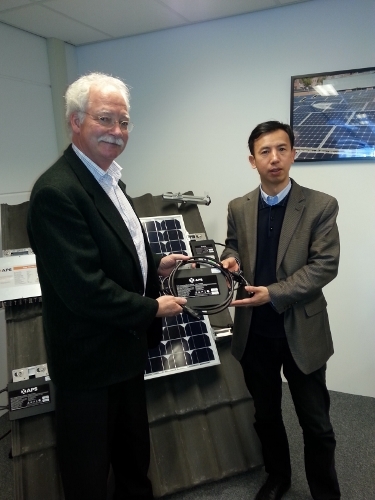 Zhi-Min Ling, CEO of APS (Altenergy Power System Inc.) and Eric Geskus, Director of FocuS-E are showing the key product, YC500, after the contract has been signed.